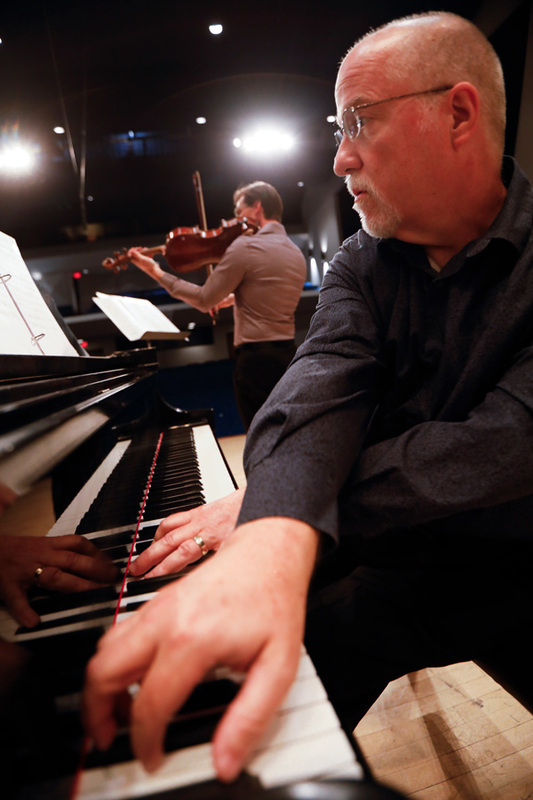 Pianist, composer, tenor and conductor – when it comes to music, Robert Pherigo does it all. Close your eyes and imagine a musical virtuoso. Who are you seeing? Mozart, with his powdered wigs? Liszt, with his aquiline nose? The Beatles, with their mop haircuts? Prince, with his velvet jackets? Toscanini? Bach? Elvis? Pavarotti? Sting? You probably didn’t see a middle-aged man in a pullover sweater named Robert Pherigo. But if you ask a musician in Kansas City to name a virtuoso, Robert’s name usually tops the list. Robert Pherigo is quiet. He has a shy smile and an unassuming demeanor. Then he sits down at the piano and magic happens. Pherigo is not just a pianist; he’s a composer, tenor and conductor, too. He was a member of newEar Contemporary Music Ensemble for 15 years, a tenor in the Kansas City Chorale for 10 years, and has composed works for many local ensembles. Many say his greatest strength lies in his ability as an accompanist. 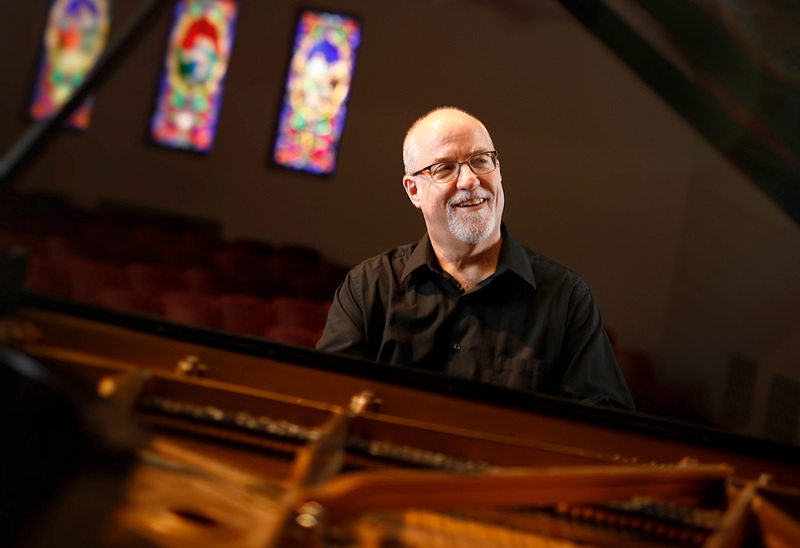 Indeed, his resume reflects this; he has worked as a collaborative pianist for newEar Contemporary Music, Lyric Opera of Kansas City, Kansas City Symphony, Kansas City Chorale, Chicago Symphony, University of Missouri Kansas City, William Baker Singers and Northwestern University. But Pherigo wears many other hats. Pherigo’s first exposure to music came from his father, who had an extensive classical record collection. Raised in Kansas City, Robert left the area to attend college at Arizona State University, where he studied piano performance under Robert Hamilton and met his wife, Lyra. Robert and Lyra don’t only collaborate musically, of course. “Our best collaboration has been our son, Lucas,” says Robert. Lucas Pherigo, 25, is a talented musician in his own right. He sings with Central Standard, an a capella ensemble, and conducts the Cody Choraliers Barbershop Chorus in Leavenworth. Growing up in the Pherigo household, with his parents as his first teachers, prepared him well for an active musical life. Coleen Dieker, a go-to musician in the Kansas City community who studied piano with Pherigo when she was a teenager, knows this advice well. “Intense” might not be a word you’d use to describe Robert Pherigo if you just sat down to have coffee with him. Or go on a bike ride with him. But it is a fitting word. Sometimes his zen personality zeros in on the music and buzzes with something that can only be called intensity. That intensity is something Pherigo searches for in every musical experience and treasures when he finds it. Pherigo did not have a place to perform the piece when he started his project. He just wanted to create a challenge for himself. “I love that Robert always challenges himself to new experiences in music, be it writing about music, or listening to a new composer every week for a year or memorizing the extremely difficult Concord Sonata,” Stölzel says. But you’d be hard-pressed to get him to talk about the experience. For him, the work was done when he completed it, not when he presented it in front of an admiring audience. “He has a peacefulness about him that makes for an amazing place to play music from,” Dieker says. “And his laugh,” Anderson adds. “You have to hear Robert’s laugh. It’s amazing.